The English writer, Lady Mary Wortley Montagu, née Pierrepont (1689-1762), was born in London of an aristocratic family. 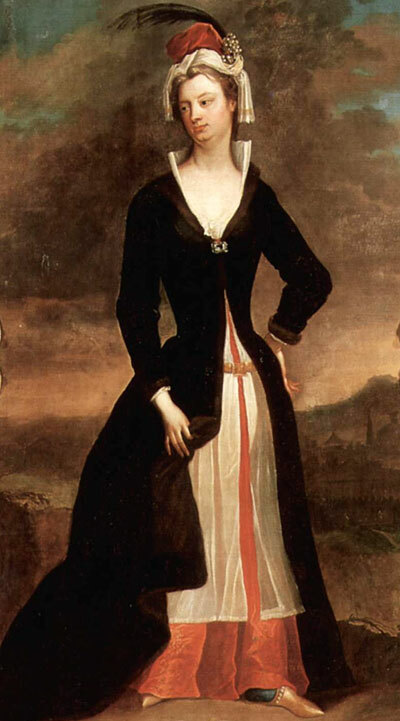 In 1712 she married Edward Wortley Montagu and accompanied him to Istanbul four years later where he was to serve as British Ambassador (1716-1718). The account of their voyage to Istanbul and her observations about life in the Ottoman Empire were recorded in her widely read memoirs, written in the form of letters from Turkey. One letter, written on 1 April 1717, includes remarks about her first encounter with some Arnaouts, i.e. Albanians. But of all the religions [sic] I have seen, the Arnaöut [sic] seem to me the most particular. They are natives of Arnaöutlich, the ancient Macedonia, and still retain something of the courage and hardiness, though they have lost the name, of Macedonians, being the best militia in the Turkish empire, and the only check upon the janissaries. They are foot soldiers; we had a guard of them, relieved in every considerable town we passed: they are all clothed and armed at their own expense, generally lusty young fellows, dressed in clean white coarse cloth, carrying guns of a prodigious length, which they run with on their shoulders as if they did not feel the weight of them, the leader singing a sort of rude tune, not unpleasant, and the rest making up the chorus. These people, living between Christians and Mahometans, and not being skilled in controversy, declare that they are utterly unable to judge which religion is best; but, to be certain of not entirely rejecting the truth, they very prudently follow both, and go to the mosques on Fridays and the church on Sundays, saying for their excuse, that at the day of judgment they are sure of protection from the true prophet; but which that is, they are not able to determine in this world. I believe there is no other race of mankind have so modest an opinion of their own capacity.